so click on the "Search Button" above and search for "101". A team of medical experts (Jennifer Morrison, Omar Epps, Jesse Spencer) treats a patient with a mysterious illness in HOUSE premiering Tuesday, Nov. 16. Wilson tells him the patient is his cousin. Other doctors thought it was a brain tumor which was House's first guess. Later, House considered inflammation of the blood vessels in the brain. 1) A guy who is orange (from carrots & vitamins) and House deduces that his wife is having an affair. 2) A 10 year old with asthma whose mother doesn't want him taking strong medicine. 3) Guy who diagnosed himself on the Internet to whom House gives candy in a pill bottle. The music playing at the end of this episode was "You Can't Always Get What You Want" by the Rolling Stones. This is available on two albums "Forty Licks" and "Let It Bleed" you can listen to a sample of this song at Amazon's pages on these albums (click on the album title here and again at Amazon then go to the bottom of the next page to get a choice of which song to listen to). This song was also played at the end of the First Season Finale episode, "Honeymoon". ***"Forty Licks" is also available from Amazon UK in Britain as is "Let It Bleed"
Rebecca: "Is he a good man?" Wilson: "He's a good doctor." Rebecca: "Can you be one without the other? Don't you have to care about people?" Wilson: "Caring's a good motivator. He's found something else." House: "...she's my patient that's what you do with patients. You give them medicine." 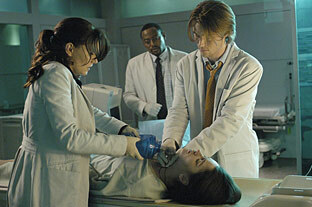 Cuddy: "You don't prescribe medicine based on guesses. At least we don't since Tuskeegee and Mengele." House: "You're comparing me to a Nazi? Nice." Cameron: "You can't diagnose that without a biopsy." House: "Yes, we can, we treat it. If she gets better we know that we're right." Cameron: "And if we're wrong?" House: "We learn something else."